Work is a bit all-consuming at the moment. I don't think I've ever used the word "dread" to describe how I feel about work. I am sure it will pass. In the meantime, Quintus has been blogging up a storm. I found this photo by Vittorio to be deeply disturbing: "When you stare into the abyss, the abyss stares back into you." This article by Frances Hocutt on her experiences in graduate school in chemistry is worth reading and thinking about; I am glad she wrote it. Also, for your listening pleasure (? ), Professor Paula Stephan (author of the book "How Economics Shapes Science") is on YouTube, presenting a lecture from her book. (It was filmed at an institute in France, which is fun.) Towards the end of her talk, she suggests rebalancing US R&D funding away from the health sciences towards the physical sciences. Yes! An article that I wrote for Chemistry World has been published, incidentally. The illustration is fun, though I'm usually wearing safety glasses and carrying a much more quizzical look. Ask CJ: graduate programs in Europe? And by international I don't mean just Europe, I'm really interested in the options across the globe. I think that it is common enough, but apart from ETH-Zurich (and the like), I don't know where it is common for Americans to go in Europe for graduate studies in chemistry. Readers? I would also be interested in hearing about chemists who have done graduate programs in Japan -- I know that there are some, I believe. ...for a recording of a discussion/debate (?) between Linda Rosen, CEO of "Change the Equation" (a pro-STEM education organization) and Michael Teitelbaum, a demographer scholar on scientific labor economics from the Alfred P. Sloan Foundation. It happened this weekend at the convention of the Education Writers Association. From the #EWASTEM tag on Twitter, it appeared that both of them got their message out to the gathered education reporters. I'm promised a recording at some point by the EWA folks -- I'll let you know what I hear/think. The Department of Transportation said the major railroads had agreed to eight voluntary measures one month after the secretary of transportation, Anthony R. Foxx, met with railroad executives in response to a series of derailments and explosions involving trains carrying crude oil. Seems to me that if we're getting railroads agreeing to things, this is a sign that they're moving voluntary to avoid federal regulation. We'll see. "ACS Continues To Build Foundations For Success"
The challenges have been numerous. The uneven recovery of the global economy since the Great Recession and a divided federal government continue to seriously affect our members. Job growth has remained sluggish, and industrial layoffs in chemistry-related sectors continue. ACS members who depend on federal grants to conduct research have faced high hurdles in getting new or renewed grants. Many of the challenges facing the U.S. have also faced other developed as well as emerging nations. With this difficult environment as a backdrop, ACS again made a concerted effort to increase our membership in 2013. New member programs were designed and introduced, and enhanced marketing efforts were tailored to promote the value of ACS membership to each demographic group. Thanks to such efforts, ACS ended the year with 161,140 members, which was a drop of just 1.3% from the end of 2012. ACS remains the world’s largest scientific society, and I am confident that we have built an important foundation for growing our membership in the future. I assume that no ACS CEO wants to be known as the one that lost the title of "world's largest scientific society", but I have to ask myself -- why is this a point of pride? Why is "we're really, really big" a big deal? I am sure that some of it translates into money, but most ACS revenue comes out of ACS Publications, so I don't really think it's dues money that drives this push. "The world's most influential scientific society"
"The world's most respected scientific society"
"The world's most fun scientific society"
...and to a great extent, I am sure some of those might be true now. But no, we're probably better off thinking about being the world's biggest. This Stephen Ritter piece on recycling spent bauxite ore was really interesting, I thought. A little comment by Robin Giroux on chemistry sets and a modern redesigning of them. An enjoyable and critical look at "personalized medicine" by Rick Mullin. The "Patent Picks" section looks at biofuels this week. But at the end of the day, when people are demanding that you do the impossible, your job is to explain why you can’t. The ability to manage the expectations of nontechnical users is actually an important piece of domain knowledge for technical people; if you flub that, you’ll fail just as surely as if you get the hardware or software wrong. And, of course, on the other side, nontechnical stakeholders should make it their business to find out what is possible before, not after, they commit to designs and deadlines. We are all scientists [redacted], and have been with the company for less than five years. We all reported to the same manager when [Andy] was hired in (they were recruited and befriended by Bob early on) which set us up as a peer group. Since then, our lab has since restructured such that Bob and I still report into a common boss, but now Andy reports into Bob. Andy has noticed some changes in behavior in Bob. Bob has always liked to kid/tease, but the new power dynamic really screws with Andy's comfort level in engaging back thusly. Bob has also begun to come across as very patronizing when assisting or training Andy. I've noticed some pretty unsavory people management tactics being employed by Bob (ambush meetings, including performance review, for example), but I've tried to cut him some slack as a first-time manager. I've pointed out to Andy these tactics employed by Bob and that he's likely intentionally using them to put himself at an advantage during meetings. I think at heart, Bob is a good guy and truly hope he's merely experiencing a learning curve as a new manager. As I'm still Bob's "peer" instead of "direct report", I'm trying to think of ways to use that status to directly or indirectly affect some change in the uncomfortable aspects of Andy and Bob's interpersonal dynamic. I'd like to think that having a friend for a boss is a good thing. In general, bosses ideally should be helpful people in that they should equip you with tools and training to do your job. They should also have your best interests in mind, if not for benevolent reasons than at least because they're hitching their future onto yours and should be looking to develop and promote you as a way to promote themselves. I have a friendly relationship with my boss, but he's been my boss since day one. I think the truly sticky parts of this situation arise because of that transition from a "peer" friend to a "boss" friend and the associated change in the power dynamic. Power can change a person, some friends are undoubtedly going to be poor managers, and the situation is fraught with other quagmires that both parties (although probably more often the direct report) will have to learn to navigate. This is a rather wonderful case of serendipity, in that I was actually commenting on when one of your friends says something that makes it obvious that they have switched their mentality from "worker" to "boss." But then again, it got me this wonderful (?) dilemma, so who am I to argue? I've been in Charlie's shoes, where I was acquaintances with "Danny", and then ultimately his direct report. That situation worked out, so far as I could tell, quite well. Even though Danny was younger than me, I felt that he was more experienced and quite a bit more emotionally mature than I was, especially with regards to our relationships to authority. If Danny had begun using odd management techniques like ambush meetings*, our relationship would have changed significantly. I think that Charlie is being really smart in recognizing that Bob is a new manager and should be cut a little bit of slack in the beginning. Have you been in Andy's situation? For those who have direct reports, have you ever been a Bob? How did you get better? How long should Bob's shakedown period be? Should it be measured in months or years? What is the best way for Charlie to influence Bob? How friendly should you be with your boss? *I have been the recipient of one. It may have been deserved. It was not fun. 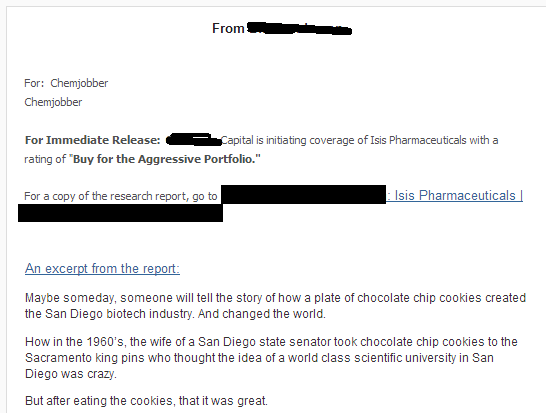 From the inbox, someone's idea of a hot stock tip. I, uh, don't think this is a great buy, according to what I see from Derek's blog over the years. For future reference, I do not recommend the purchase of individual stocks for a retirement portfolio. But then again, I'm a pretty boring guy and I like to stick to pretty boring advice. The seven-week course starts on March 10th. Each week has about 1 hour of video and a number of accompanying web pages. The overall goal of the course is to get a student up to speed to watch a medicinal chemistry lecture (and maybe even ask a question at the end). If you haven't taken a medicinal chemistry class in college or grad school, it seems to me that this would be a great (and free!) opportunity to learn a little. Good morning! Between February 13 and February 17, there were 128 new positions posted on the C&EN Jobs website. Of these, 25 (20%) were academically related. Not counted: 14 irrelevant academic positions and 3 irrelevant private sector positions. Ahhh, the Pfizer onslaught continues: I think I've figured it out, which is that Pfizer is repeatedly posting (so far as I can tell) 72 positions weekly. This constitutes 56% of new C&EN Jobs positions for this time period, even as most of them seem to be repeats from before. There are some that are relevant, and many that are most certainly not. Latrobe, PA: Looks to be a B.S.-level metallurgy position with Latrobe Specialty Metals -- interesting. The Operational Evaluation Division (OED) has an immediate career opening for an Analyst supporting the Department of Defense's assessments of the performance of personal protective equipment, vulnerability of military ground combat vehicles, and lethality of weapons/munitions. IDA research staff members conduct multi-disciplinary analyses in a small-team environment. IDA takes great pride in the high caliber and timeliness of its analyses, which are produced in an atmosphere that encourages independent thinking and objective results. The Live Fire group supports and advises Department of Defense officials regarding the Live Fire test and evaluation of Major Defense Acquisition Programs. The Analyst will support test planning, observe realistic survivability and lethality testing, conduct independent analyses, and provide written assessments to the Department of Defense’s Director, Operational Test and Evaluation. The Analyst will conduct in-depth analyses of data from ballistic testing of personal protective equipment, ground combat vehicles, and weapons/ munitions. Like swallows to Torrance: Phenomenex has posted its usual slots for organic surface chemists (2 years industry experience) and the like. India: I see Piramal is advertising positions in India. Upton, NY: Brookhaven National Laboratory is looking for a electron microscopy postdoc. Grand Rapids, MI: Meijier is hiring a FIFRA/TSCA specialist; needs relevant experience. The Irrelevants List: Are you a chemist? Do you wish to work in chemistry? C&EN Jobs would like to know if you might be an RN. Memphis, TN: The University of Tennessee Health Center is searching for a tenure-track professor of medicinal chemistry at all levels. Morris, MN: The University of Minnesota - Morris wishes to hire for a "full-time, multi-year" undergraduate teaching position. Does UMM not have tenure? St. Cloud, MN: St. Cloud State wants an assistant or associate professor in polymer/materials chemistry. Huntington, WV: Marshall University desires an associate professor of biochemistry, preferably with synthetic biology expeirence. St. Thomas, U.S. Virgin Islands: Now there's one you don't see very often. The University of the Virgin Islands wishes to hire an assistant or associate professor of chemistry, preferably one that can teach physical chemistry. Grand Forks, ND: The University of North Dakota wants a lecturer for chemistry. Brr!! Conway, AR: Hendrix College (the alma mater of chemblogosphere eminence grise Derek Lowe) is searching for a visiting assistant professor of chemistry. Lewisburg, PA: Bucknell University desires an visiting assistant professor of chemistry. Want to teach high school chemistry/science? : This is part of the new C&EN Jobs -- lots of primary/secondary ed positions. Here's one in Cleveland. Here's one in DC. And one in Maryland. They seem to trend towards private schools or charter schools. The Irrelevants List: Are you a chemist? Do you want to teach or do research in chemistry? C&EN Jobs wants to know if you'd like to be a research associate in value-based health care delivery at Harvard Business School. How about being an adjunct professor of ethics? Physics postdoc, anyone? 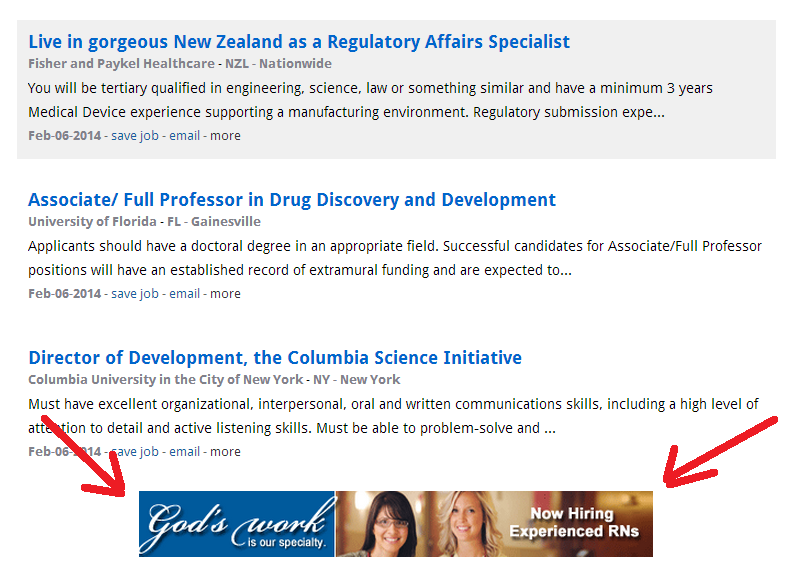 I've noticed that certain categories of positions are showing up repeatedly: development directors, medical specialties, research assistant positions and astronomy/geology positions. Interesting. What is Scott Lockledge trying to say? Scott Lockledge is a CEO of a AFM tip manufacturing company -- he's just published an editorial in this week's C&EN about the advances in biomedicine and where chemists can play a role. He believes that chemists can aid in the understanding of aging, cancer, neuroscience and genomics. I don't doubt that he is right and that chemists can take the lead in some of these fields. Readers, could you take a moment to read his editorial? Then feel free to come on back. Of the 4 fields he described, they are nearly all molecular biology-related fields. What role can chemists play in these, other than their traditional ones (i.e. detecting/measuring molecules, synthesizing molecules for use as therapeutics or tool compounds?) In what sense do chemists have something special to add? How in the name of all that is holy can Dr. Lockledge claim that "At no time has it ever been better to be a chemist or a chemical engineer than today. Never." even as he stipulates "record high unemployment, the limited job opportunities for recent graduates, or the salaries lagging behind those of other professions"? I am willing to buy into "chemistry will have a bright future if (blah blah)", but this insistence that it's The Best Time of All Time to be a chemist is skepticism inducing. In another initiative designed to meet industry’s skills shortfall, life sciences companies and chemical firms have come together in a newly developing Science Industry Partnership (SIP) to build scientific talent across the sector in the U.K. Led by GlaxoSmithKline and featuring about 200 firms including Actavis, Fujifilm Diosynth Biotechnologies, and SABIC, SIP will learn in the coming weeks whether it has been successful in securing $52 million in public funding for a variety of skills enhancement programs across the industry. SIP’s vision is to develop a new “skills system” starting with high school students through to graduate and postgraduate students. “It’s all a matter of developing tomorrow’s scientists today,” says Nigel Brooksby, chair of the Life Sciences Skills Strategy Board, a division of Cogent, the U.K. skills body for the science industry. ...The introduction of the program comes after a period that has seen apprenticeships decline in number and where, particularly in life sciences, firms have found it difficult to recruit individuals skilled in certain fields. “Technician level is where we really need trainees,” says John Holton, strategy director for Cogent. U.K. companies have to keep refilling the pipeline with newly trained technicians because of the amount of poaching that goes on by competitor companies, he says. I sure wonder why they're going to competitors. I wonder if it's because they have higher pay? I'd hate for UK companies to have to raise pay, too. Much better to refill the pipeline. Yes, that's it. A sort of kooky letter about the forensics surrounding the Annie Dookhan case. This Sarah Everts piece with a chemist-turned-professional-smeller is amazing. Fun interview with Adam Engel (the chemistry graduate helped out by Jon Stewart) by Linda Wang. See Arr Oh and I recorded a podcast talking about his adventures as a chemist at a startup. Give it a listen! 7:45: In hindsight, what does SAO wish he knew beforehand? 17:30: What are interviews for mid-career chemists like now? 22:00: What's different about interviews now? 29:30: "You are more than just your job." 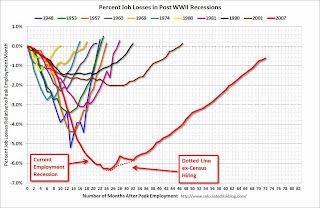 John Lechleiter's distortions of "600,000 unfilled manufacturing positions"
Right now, there are over 600,000 unfilled manufacturing jobs in America. Many employers are eager to hire. They’ve got capital set aside specifically to invest in expanding their workforce. And they have applicants — problem is, many of them simply don’t have the training and education needed to perform the work. High unemployment is not making it easier to fill positions, particularly in the areas of skilled production and production support. There’s no way around it: respondents report, on median, that 5% of their jobs remain unfilled simply because they can’t find people with the right skills. Translated to raw numbers, this means that as many as 600,000 jobs are going unfilled, a remarkable fact when the country is facing an unemployment rate that hovers above 9%. First, the report is from 2011. 2nd, it's not a census of unfilled positions, it's an online survey of executives asking their opinion of the matter and finally, it's an extrapolation of their opinion. It's a wild guess and this number is being used to lie to the general public and politicians -- it's a damned shame. Also, Lechleiter's claim that "private industry is expected to add about one million new STEM positions over the next decade"? 75% of those are in computers and engineering, with only 5-8% being life science oriented. What is stunning about this is that Lilly is in a relative shambles, yet Lechleiter's passion on this issue is so strong that he's going around Washington, shaking a tin cup for Bill Gates and Sergey Brin. I don't get it. ACS Committee on Chemical Safety: "Stop Using the Rainbow Demonstration"
The American Chemical Society Committee on Chemical Safety recommends that the “Rainbow” demonstration on open benches involving the use of flammable solvents such as methanol be discontinued immediately. When carried out on open benches (outside of a chemical hood) these demonstrations present an unacceptable risk of flash fires and deflagrations that can cause serious injuries to students and teachers. On an open bench, invisible flammable vapors can flow across and off of the bench to the floor where they can be ignited by a flame, a spark (even static electricity), or even a hot surface. Even carrying out this demonstration in a hood poses risks if solvents are not adequately controlled. If you are considering this “Rainbow” demonstration or have used it in the past, we urge you to stop using this demonstration. There are alternatives available that demonstrate the same rainbow colors but don’t use flammable solvents on an open bench. These alternate demonstrations involve soaking wooden splints in salt solutions and then placing the splints in a Bunsen burner to observe the salt’s characteristic color. Link to the whole document, with the alternatives at the bottom of the page. So what is the best way to get this in front of high school chemistry teachers? In the matter of the Beacon School incident, the teacher has been reassigned for now from her position at the school. Friend of the blog (and PerkinElmer Informatics marketing guy) Philip Skinner has passed along this really fun periodic table application to demo some of the features of Spotfire. For those of you who don't know, Spotfire is a program that helps chemists organize data (among other things); when I have seen people use it in the past, it feels like a database manager, like an Excel for molecules. Go and check it out -- it's a lot of fun. A favorite little detail of mine is that for the more modern, newer elements, the "discoverer" picture changes from antique portraits to a logo of whatever organization owns the relevant particle accelerator! Good morning! Between February 11 and February 12, there were 66 positions posted on the C&EN Jobs website. (4 were deemed irrelevant and not included on the list.) 12 (18%) were academically connected. Sigh: sort of a mixed bag today, not much going on. More Pfizer: Another 23 positions in the last two days. Lots of analytical chemistry positions in Missouri (nice to see, I suppose), lots of other clinically-oriented positions. High school teaching: One of the recent C&EN Jobs changes has been more private/public science teaching positions being posted. Here's one for the Harlem Village Academies -- sure wish it didn't require lots of teaching experience, though. Woburn, MA: You know, I wonder if Organix has changed its salary demands for its postdocs in the last 20 years. It's 38.5k-45k on the ad right now. Lucrative! Dallas is coming: Here's an ad from 3M for the Dallas Career Fair. Pasadena, CA: JPL is advertising a "planetary science summer school", which is interesting. For "interest in a career in planetary exploration." Process Wednesday: 10% NBS in DMF will exotherm -- who knew? Credit: Shimizu et al. Org. Process Res. Dev. ...The stabilities of mixtures of NBS and solvents were probed with ARSST experiments using the following procedure. 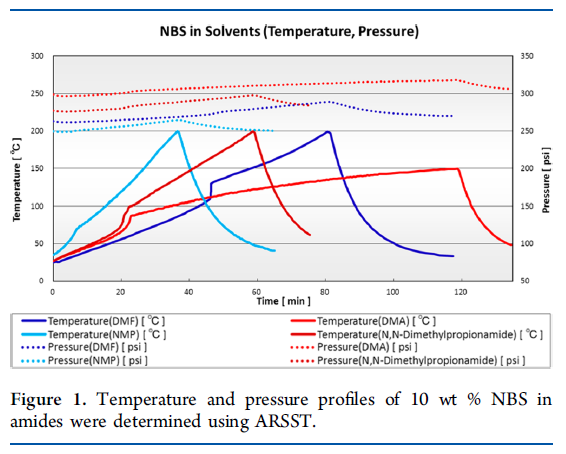 A 5-g sample of 10 wt % NBS in solvent was loaded into the ARSST 10-mL glass test cell with a Teflon-coated thermocouple, which was sealed in a 350-mL vessel and pressurized to 250−420 psi nitrogen to prevent solvent evaporation. The samples were heated from 30 to 150−200 °C at 2−3 °C/min under a polynominal control condition by stirring with a Teflon-coated magnetic stirring bar. MeCN, dichloromethane and EtOAc are recommended because they show relatively small exotherms when heated with NBS. Toluene reacted with NBS to form benzyl bromide (not a surprise, really), with a 20°C rise with an onset at 108°C. The authors also analyzed NBS in DMF with RC1e reaction calorimetry; they conclude that it exhibits autocatalytic behavior. The authors note that NBS reacts with dimethylacetamide to form an adduct ; they independently synthesized it to verify. DBDMH is another brominating reagent -- it also shows similar ARSST results with heating in DMF and DMA. Acetonitrile, dichloromethane and ethyl acetate do not show significant incompatibility with NBS and can be recommended as solvents for use with this reagent. However, amides, THF and toluene do show significant incompatibility with NBS with autocatalytic behavior. The use of solutions of NBS in such solvents should be avoided, particularly at high concentration or elevated temperature and with preparation ahead of time. Ideally, a procedure should be adopted whereby NBS is allowed to react with the target substrate, either by addition as a solid or as a solution in an inert solvent. Since incompatibilities between NBS and solvents are caused by the radical cascade and the risk of incompatibilities is increased by mixing in impurities such as a radical initiator, consideration of the solvent quality is needed. DBDMH showed the same behavior as NBS, and therefore the same considerations of incompatibility would be needed. A brief perusal of the OPRD literature does not reveal a lot of uses of NBS in solvents other than acetonitrile, which is good, I think. But a good reminder that chemical safety hazards lurk in the most innocent of compounds and reagents. *"Kunito, Y. Presented at the Summer Symposium of The Japan Society for Process Chemistry, Funabori, Tokyo, July 2010. He reported that the onset temperature of DSC analysis of the NBS crystal was 175 °C, whereas that of the NBS solution in DMF (NBS/DMF = 1/1) dropped down to 63 °C." Between February 6 and February 10, there were 168 positions posted. Of these, 22 (13%) were relevant academic positions and 15 (9%) were irrelevant academic positions. Pfizer: They're still dumping positions -- 74 positions (44%) in this last time period. Some are very relevant and some are really not. Oak Ridge, TN: Oak Ridge National Laboratories is looking for a Ph.D. synthetic organic chemist; this looks to be in the Chemical Separations group. Fascinating, especially the desired background: supramolecular chemistry, coordination chemistry, self-assembly, and/or separations chemistry. Best wishes to someone. Huntsville, AL: Nektar is looking for a Senior Scientist II -- looks to be a Ph.D. analytical chemist, with significant experience. Decatur, AL: Also in the "Yellowhammer State", Hexcel Corporation is looking for a M.S./Ph.D. chemist. Boston, MA: A law firm looking for young Ph.D. chemists to be technology specialists for intellectual property work. The Irrelevants List: Are you a Ph.D. chemist? Wanna be a fixed-income investment analyst in Baltimore? No? How about a oncologist in South Carolina? Labels: fun, what is going on over there? Gainesville, FL: The University of Florida's College of Pharmacy is looking for 4 tenure-track professors of drug discovery; looks like they're looking at all levels. South Orange, NJ: Seton Hall is looking for an assistant professor of biochemistry (viewed broadly) for August 2014. Norton, MA: Wheaton College (not the one in Illinois) is looking for a visiting assistant professor of chemistry. "Teaching responsibilities include Chemical Principals and its corresponding lab" -- I guess those principles are not pals. Cambridge, MA: Dana Farber/Harvard Medical School is searching for an assistant/associate professor of biological chemistry and molecular pharmacology. Looks to be chemical/structural biology-oriented. Vienna, Austria: The University of Vienna is looking for a full professor of inorganic chemistry. New York City, NY: CUNY NYC College of Technology is looking for an assistant professor of chemistry. The college so nice they named it twice? The Irrelevants List: Are you a chemist? Do you have a Ph.D. in chemistry? Would you like to be a professor of chemistry? C&EN Jobs would like to know if you'd like to be a professor of criminal justice. How about an assistant professorship in construction management? Wanna be a physical oceanographer? Or a nuclear engineering professor? "And the little streams of alcohol / Come trickling down the rocks..."
I haven't been able to follow the entire thread but one thing I draw from what I have read is that it is incumbent on those of us who work with students at all stages in their academic careers to also advise them to consider the job market in their chosen disciplines. In so doing, they make more informed decision and they study with eyes open wide on the possibilities open to them at the next stage in their life and career journey. Much easier said than done. It reminds me of two PhD markets in recent years. One, where hundreds of applicants vied for the reported 2 or 3 job openings that year and second the hundreds of positions open for the 2 or 3 PhD candidates graduating each year. Hopefully we advise our students of the job market realities. One place a student might look for this information can be found here. Could someone please tell me of this field where there are more than 200 open positions for the 2-3 Ph.D. candidates graduating each year? (For that matter, I challenge someone to go through recent Survey of Earned Doctorates data to find the field that is only graduating 2-3 people a year? The lowest I saw for 2012 was 5, in ceramic sciences engineering, which, gee, seems to be a pretty practical field to me. Agriculture seems to be a relatively small field.) "Hundreds of positions"? Someone? 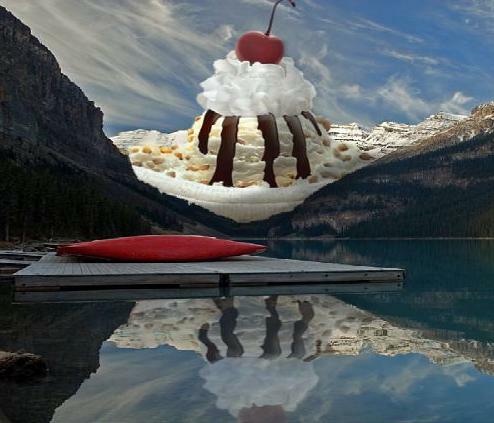 I would like to believe that the Big Rock Candy Mountain of faculty positions (or, for that matter, other positions) exists, but I have yet to find it. Readers? Carmen Drahl looks at confusion in scientific terminology. Two articles on chemical weapons destruction: one in Libya, the other on Syria by Glenn Hess. From Alex Scott: Scotland has opened a biotechnology center. I see Ian Shott is involved. From Jeff Johnson, proposed legislation for aboveground chemical storage tanks. I'd sure like to know how this will improve things. From Ann Thayer and Rick Mullin, their writeup of Infomex -- looks like things are heating up. Neat cover story by Melody Bomgardner on food additives. An interesting look by Jyllian Kemsley at chemistry major, Miss Kansas winner and Army National Guard Sgt. Therese Vail. Finally, the story of a chemist involved in the civil rights movement -- did not know about that. Thanks, Maureen Rouhi! Science, Technology, Engineering and Mathematics are distinct fields with their own definitions, traditions and employment needs. "STEM jobs" is the panacea for the world's economic ills. Nominations/entries all week, I'll pick the 5 top ones next Friday morning and we'll vote then. Enter by e-mail, Twitter, comments on the blog, I'll take it all. ...For this analysis, we have taken a job seeker- and student-centric approach to defining STEM occupations. We define STEM jobs as those that have substantial math and science requirements included within the standard course of training or as part of the qualifications that employers specifically request in postings. This contrasts with traditional methodologies which tend to focus only on jobs that are primarily engaged in scientific, mathematical, or technological activity. STEM jobs cover the following areas: Science, Information Technology, Engineering, Math (labeled here as Analysts) and Healthcare. Unlike many traditional definitions of STEM jobs, we have included those clinical healthcare roles which require that job seekers undertake substantial coursework in the biological sciences to qualify. Additionally, we have included a range of “analyst” jobs such as Data Analysts, Logistics Analysts and Business Intelligence Analysts, which call for significant mathematics training. These analyst jobs represent a far larger portion of the demand for mathematics skills in the labor market than traditional “math” roles such as Statisticians or Actuaries. To categorize medical assistants and registered nurses as "STEM jobs" is quite a stretch of the term "STEM" in my opinion. While, yes, nursing is far more biochemically-oriented than years past, I don't think nurses see themselves as "STEM workers." To categorize physicians (even wet-nosed new medical school graduates) as "entry-level" doesn't pass the laugh test. Moreover, that's one of the top occupations for this categorization! The demand for students trained in science, technology, engineering and math fields may be significantly larger than previous studies have estimated, according to new data from Burning Glass Technologies. The new analysis of millions of job postings found there were 5.7 million openings in STEM fields in 2013, 4.4 million of which required at least a bachelor's degree and 2.3 million of which were entry-level jobs that call for less than two years of experience. I await the report from Burning Glass that reports that the market for professional football players is much larger than expected, when you include the Arena Football League and the possibility that entry-level football players can use their transferrable skills to sell insurance. **Read later in the article where he refers to CNC machine tool programmers as a high-demand field. No s__t, Sherlock. ***That is not to say, of course, that we should stop kids who are interested in science from pursuing it. We should just quit lying to them about the opportunities available. Unemployment rate down 0.1% to 6.6%, 113,000 new non-farm payroll jobs created. Fresh electrons from the Bureau of Labor Statistics: in January, there were 113,000 new non-farm payroll jobs created. The unemployment rate went down 0.1% to 6.6%. The broader U6 measurement of unemployment was down 0.4% to 12.7%. Chemical manufacturing employment was up 1,200 to 796,100 positions. Unemployment for college degree holders was down 0.1% to 3.2%; unemployment for those without high school degrees was down 0.2% to 9.6%. Thanks, as always, for the graph to Calculated Risk. Ask CJ: What if I want to get an MBA? A reader asked me recently if I knew about pharmaceutical companies and their willingness to help pay for their employees to get MBAs. 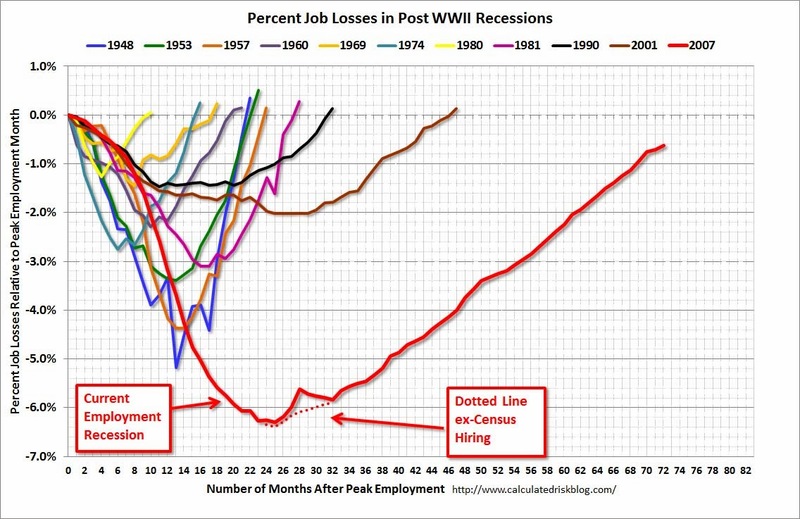 All joking aside, I wonder if anyone knows about this sort of thing and how it is working out in the post-recession era. In the past, it seems that companies were willing to pay for outside education for entry-level employees. I assume that sort of thing still goes on (along with a variety of other fringe benefits, housing assistance, etc) at larger companies, probably not at smaller ones. I don't really have an opinion one way or another about MBAs. It is my uninformed impression that night-school MBAs are good for credentialing/signaling that you can read a balance sheet, but that it's only the very top of the MBA pile (the Harvards/Stanfords of the world) that will be able to get significant financial boosts from their degrees. Readers, any thoughts? How is your company doing in terms of paying for more education for you? Leave them in the comments. Good morning! Between February 4 and February 5, there were 65 new positions posted on C&EN Jobs. Of these, 24 (37%) were academically connected. Pfizer continues: 24 positions in the last two days. Wow. Of course, a lot of them are sort of kooky, like this "Clincal Operations Feasibility Lead" position -- yep, lots of chemists qualified for that one. Some are definitely worth it, like this cheminformatics postdoctoral position -- I'd think it would be the right position for someone. Bethesda, MD: NIH looking for an experienced M.S./Ph.D. synthetic radiochemist for PET work. Also, they're looking for a M.S./Ph.D. analytical chemist. Zeroes! : AbbVie (North Chicago, IL) metabolism group looking for a B.S./M.S. associate for drug metabolism work. 0-3 for B.S., 0 for M.S. Spring House, PA: Janssen also looking for a senior Ph.D. chemist for a radiosynthesis position. Cambridge, MA: BIND Therapeutics looking for a medicinal chemistry associate; 2-5 years of industry experience. "Northern New Jersey": Takasago looking for a food scientist. Little Lost Lamb: eFinancialCareers looking for a "senior manager - stress testing." Yes, lots of chemists know about Basel III capital requirements. My brief thoughts upon a binge reading of Barry Werth's "The Antidote"
- The story of the manufacture of Incivek API, including the revelation that two of the five segments were manufactured by WuXi early on. - A record of the formulation research behind Incivek, including a fairly detailed look at its spray-dried dispersion technology. - A really gripping account of one CF patient and the absolute elation/desperation that he felt with getting Kalydeco (Vertex's cystic fibrosis drug) and then not having it. - Nearly as great at telling the human stories of scientists, compared to "The Billion Dollar Molecule." A good read, not quite as good as "The Billion Dollar Molecule", but still worth the ~$13 I paid for it. We are seeking an AP Chemistry writer who can research the revised exam, review our existing AP Chemistry test preparation material, and rewrite (revise) content and practice test questions. Full job description and contact information here. Best wishes to those interested. Good morning! Between January 30 and February 3, there were 131 new positions. Of these, 34 (26%) of them are academically connected. PFIZER: Sooo, remember back when Merck would pump all of its positions into (then) ACS Careers? Well, now Pfizer is doing the same thing. Currently, there are 83 Pfizer positions, 75 of them in the relevant period. Quite a lot of them them are irrelevant to ACS members. Not many ACS members have a M.D. and a Ph.D. in molecular epidemiology. But, that said, an associate-level analytical chemistry position is indeed relevant. You take the good with the bad, I guess. Bartlesville, OK: Chevron Phillips is looking for a B.S./M.S./Ph.D. chemist to be a technical service engineer -- sounds intriguing. Experience in Chromatography and/or Molecular Spectroscopy. Experience in the area of specialized lubes and fuels certification tests. Sacramento, CA: Ampac Fine Chemicals is, once again, searching for experienced organic chemists at all educational levels to be process chemists. (2 openings) Also, an experienced B.S. analytical chemist position. Upton, NY: Interesting radiochemical quality control position at Brookhaven National Laboratories. B.S. in chemistry desired. South San Francisco, CA: Genentech is looking for a B.S./M.S./Ph.D. chemist to be a protein analytical chemist. It's just as bad: C&EN Jobs continues its patch of irrelevant positions. I've counted 19 for this time period -- they are not included in the numbers above. Here's an accountant position for the Radiological Laboratory at Stanford. Here's a position for a M.D. or a D.O. to be a section chief in general medicine. C&EN Jobs can and should do better. It's not hard to screen these positions out -- they're not passing the laugh test. Dublin, Ireland: Trinity College Dublin is looking for a full professor of pharmaceutical chemistry. Looks to be drug discovery-related. Elon, NC: Elon University is searching for an assistant professor of analytical chemistry. New York, NY: CUNY-City College is looking for an assistant professor of isotope geochemistry. Madison, WI: Looks like the University of Wisconsin desires a Ph.D. NMR spectroscopist to help with its instrumentation. Monroe, MI: Monroe County Community College is looking for a M.S./Ph.D. chemist for an instructor position. Swarthmore, PA: Swarthmore College is looking for a Ph.D. chemist to be a visiting assistant professor of physical chemistry. I can’t stomach any more hypocrisy from Eli Lilly CEO John Lechleiter. Lechleiter has made an appeal in two recent articles in The Star for stronger science, technology, engineering and math (STEM) education so that businesses such as Lilly can be competitive with peer companies. While it is admirable to push students to take challenging curriculums in school, Lechleiter is responsible for displacing at least 5,500 employees from Lilly from 2010 to 2013 who had the educational credentials he claims are void in Indiana. Lechleiter should remain silent on this matter as his action of discarding these highly educated people demonstrates his true value for STEM-educated people. I can't figure out which articles that Ms. Bain is referring to, but this is probably one of them, and this editorial in the Indianapolis Star is fairly supportive of Dr. Lechleiter's position. Retrophin is looking for director-level positions in the above areas; looks like 5+ years experience can be substituted for Ph.D. degree. Best wishes to interested applicants. Contact Fazela Mohamed (fazela -at- retrophin/dot/com) if interested. Via Pig Farmer, the phone call where Freedom Industries calls the West Virginia Department of Environmental Protection to report the spill of MHCM into the Elk River. A chemist who admitted he stole more than 100 confidential silicone formulas from Wacker Chemical and then sold many to a South Korean competitor is going to federal prison for two years. However, the complaint against Agoda, filed in U.S. District Court for the Eastern District of Michigan, paints a different picture. According to the document, KCC paid Agoda $132,621 between March 2010 and January 2012. Agoda made 12 trips to South Korea paid for by KCC. Wacker figures it lost about $15.5 million because of Agoda’s actions. Agoda worked at Wacker’s Adrian, Mich., facility for 20 years until 1997. He was employed by Laur Silicone, a formulator in Beaverton, Mich., when he started selling Wacker formulas to KCC, court documents say. Why did he sell the formulas now? How did he leave the employ of Wacker? How long did he sell the formulas? One of the things that I find most interesting about these sorts of cases is how little money can be gained through the selling of secrets. If Mr. (Dr.?) Agoda had been asked, would you trade two years in federal prison for $130,000, I suspect he would have said "No." Another MICE case, chalked up to Money, I wager. According to a criminal complaint filed in the Michigan court in April 2012, Agodoa, a native of Ghana, joined the former Stauffer Chemical Co. as a plant chemist in 1977. In 1987, Wacker purchased a controlling interest in Stauffer and changed the company's name. Agodoa continued with Wacker until July 1997, rising to the position of technical manager and leaving to accept a job with Jamak Fabrications, the complaint said. Between 1991 and 1996 alone, Agodoa signed some 78 formula and manufacturing instruction sheets that were clearly marked as confidential, according to the complaint. He was disciplined in 1994 for giving chemical samples to visitors to the Wacker plant—a willful violation of company policy and a potential violation of federal law, the complaint said. By 2011, Agodoa was a senior scientist at Laur Silicone Inc. In June of that year, according to the complaint, he tendered his resignation, saying he had accepted a consulting job with KCC Silicones and also that he was helping a South Korean firm develop the oil reserves found at a town in Ghana. However, in a routine system and password change after Agodoa's resignation, Laur discovered in a search of Agodoa's email records that he in fact had been selling Wacker's trade secrets to KCC Silicones. Looking forward to reading Lauren Wolf's look at lead and neurodevelopment in young people. I enjoyed reading Jyllian Kemsley's look at excipients in drug formulations -- interesting to see that once adulteration happens (i.e. melamine in protein products), manufacturers have to spend lots of money making sure that adulteration isn't happening. An unfortunate aspect of globalization? This letter to the editor asking what role American chemists had to play in the Cold War sounds... provocative.